SARASOTA, FLA.—Access Sarasota is a government-access channel that’s shared between Sarasota County and the city of Sarasota. It’s available locally via cable and we also provide live and on-demand coverage of city commission meetings on the city’s website. We upgraded our system with an SVideo infrastructure in 2000 and a couple of years ago found ourselves with the difficult challenge of repairing and replacing analog equipment that was now obsolete. This led to our decision to do a rebuild that incorporated HD production and allowed us to incorporate a digital workflow. 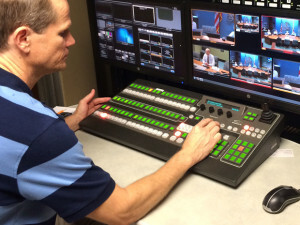 The upgrade was completed earlier this year and included replacement of our aging switcher with a Broadcast Pix Granite 2000 integrated production switcher. The decision to install a Broadcast Pix system was based primarily on the recommendation of the integration firm we selected, Encore Broadcast Solutions. We normally don’t do much elaborate production— mostly coverage of meetings with persons sitting around a table—and initially wondered if the Granite might be more switcher than we really needed. However, Encore suggested that we would likely want room to grow and they were right. We’ve found that the 11 inputs available on the Broadcast Pix switcher allow us to incorporate supporting materials provided by individuals appearing at these meetings very effectively and seamlessly. The new switcher gives us access to such video and graphics sources as DVDs, USB thumb-drives, tablets and more; something that was not easily done in our analog environment with its limited switching capabilities. We started using the new system this past March for meeting coverage, and we’re still just scratching the surface of its capabilities. We can do things we just couldn’t do before, and we have the freedom to think creatively and improve our production values. With our old system, even incorporating program opening and closing roll-ins was a complicated process. Now, the new Broadcast Pix setup makes such programming enhancements simple with its built-in clip store. Granite’s built-in production tools have also improved our workflow. We’ve also found that the Inscriber character generator is a huge improvement over our old PC-based graphics, which were poorly integrated into our system and positioned poorly in our control room. Having the c.g. inside the switcher is so convenient—there’s no rolling your chair back and forth between workstations, and it’s so much easier to make changes. We also love the switcher’s Fluent-View multiviewer option which allows you to see everything you’ve got. We’ve used it to customize our video I/Os across two 23- inch LCD monitors. We also use the Granite for camera control, and Encore and Broadcast Pix engineers created a special application programming interface that provides integration of the Granite with the AMX control system in the commission chambers, allowing a staff member to run the production remotely if necessary. Every time I sit down in front of the new switcher to produce chamber meeting coverage I’m more convinced than ever that going with the Broadcast Pix Granite was the right decision. It makes our productions so much easier and better.